Located in Panama City Beach, Florida, the Shipwreck Island Water Park opened back in 1983. The tropical-themed water park is a hit with guests who enjoy the 20-acre property filled with fun attractions and food and beverage outlets. 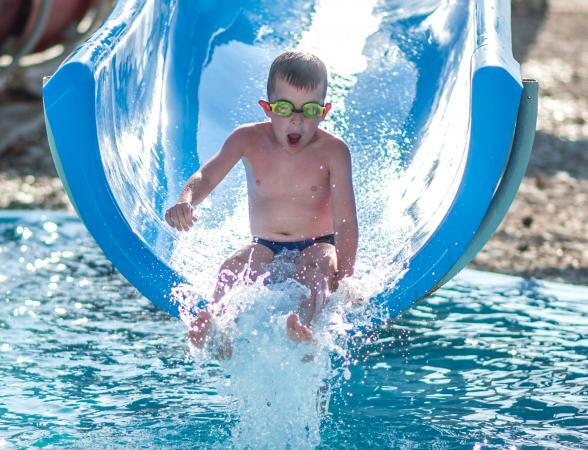 Shipwreck Island offers a variety of water slides, a lazy river, a wave pool, and more. White Knuckle River: Twist and turn as you wind down a 660-foot-long waterway on an inner tube large enough to fit your entire family. Tree Top Drop: Two slides come off a 65-foot platform. One is a dark tube that drops you on a free-fall slide down a rapid drop. The other option is an enclosed twisting tube slide. Zoom Flume: This is the oldest attraction at the water park. Riders cruise down three flumes that curve in and out, and around a huge hill, and then end in a big splash pool. Skull Island: The family friendly pool includes a kiddie slide and a family racing slide. There's also a giant 700-gallon tipping bucket. Some slides have height restrictions. Raging Rapids and Tree Top Drop require that guests be 48 inches or taller to ride. Riders on Pirates' Race must be at least 40 inches in height. There are a variety of food options available. These include pizza, grilled chicken sandwiches, hot dogs, meatball subs, funnel cakes, and ice cream. Guests cannot bring food, beverages, or coolers inside the park. Lockers are available for rent for those who need to store items. Shipwreck Island is only open seasonally, usually starting out toward the end of April. Operating days are reduced during April and May before opening every day in June and July. August can be sporadic, with early September marking the end of the season. Most days, the park is open from 10:30 a.m. to 5:00 p.m., with a few days closing at 4:30 p.m. Check the calendar to make sure they are open and what the hours are for that day. Online ticketing is available, which means you can bypass the lines and go straight to the advance purchase gate. Prices are based on height rather than age. Guests 50 inches and above are around $35 plus tax. Guests between 35 inches and 50 inches are about $30 plus tax. Guests under 35 inches are free. Seniors aged 62 and older are offered a reduced rate of around $25 plus tax, but tickets must be purchased at the gate. Season passes are available for around $100. There is also a second day discount pass available. This pass must be purchased on the day of your initial visit, and can be used with Photo ID on a later day during the current season. If you don't want to carry money around all day, you can purchase "Splash Cash." This is a wristband debit card, and you can use it to pay for food, drinks, and merchandise. Unused credit will be refunded to you before exiting the park. Discounts are available by bringing a receipt from select Pier Park merchants who partner with Shipwreck Island. They will give you a discount of about $4 per person for up to five people. Military discounts at area base offices are also available, and must be purchased in advance. They will not give a military discount at the park entrance. Birthday parties are an option at the water park. The child who is celebrating their birthday gets free admission. They have a special Birthday Party Cove to host parties, which are limited to kids 14 and under, with 10 attendees. The package price for 10 guests, plus the birthday child, is approximately $350. This includes food, unlimited punch, use of the Birthday Cove with decorations, and one hour with a birthday coordinator. Guests can bring their own cake or purchase a special cupcake cake or birthday funnel cake. To ensure the most positive experience possible at the water park, take note of the following. Shipwreck Island Water Park is located at 12201 Hutchinson Boulevard in Panama City, Florida, about two miles away from the beach. Parking is available at the park and is free for park guests. Infants and small children are required to wear waterproof swim diapers when playing in the pools, and only U.S. Coast Guard approved flotation devices are permitted inside. Weather in Florida can be unpredictable, so rain may be a concern. They stay open until closing time, even in bad weather. If there is lightning, the team will close pools and towers until the risk passes. There are some shady areas, along with tables and lounge chairs, which are on a first come, first served basis. Shipwreck Island is one of the top things to do in Panama City on TripAdvisor. Guests have a blast and enjoy visiting with friends and family, including young kids. Of the very few negative reviews, people commented the lines were long and the operating hours should be longer, especially in August when it's very hot in Panama City. According to WJHG Channel 7, Shipwreck Island made it on TripAdvisor's 2016 Traveler's Choice Awards for one of the top 25 water parks in America. US News Travel also has Shipwreck Island as a top thing to do in Panama City. Their reviewers noted they were not as impressed with the food as the attractions. USA Today's 10 Best picked Shipwreck Island the #5 thing to do in the city. Should You Visit Shipwreck Island? If you're visiting the Panama City area, and have a free day, Shipwreck Island may be a fun outing for you and your family. If you have the opportunity to visit in spring or August, you're likely to see fewer crowds. With a variety of attractions available for both adults and kids, Shipwreck Island provides fun in the sun for everyone.